Content curation is not about collecting links or being an information pack rat. It is more about putting resources into a context with organization, annotation, and presentation. Content curators provide a customized, vetted selection of the best and most relevant resources on a very specific topic. If the notion of content curation is new to you, or if you want to brush up on your understanding of the concept, choose from one of the following references to learn more. A Blog post about Teacher As Curator by Ted Curran. Each of these resources reveal that content curation likely aligns well to what you already do when you design and develop your courses to facilitate learning. Here, we simply reframe the process and identify tools and strategies to assist you. 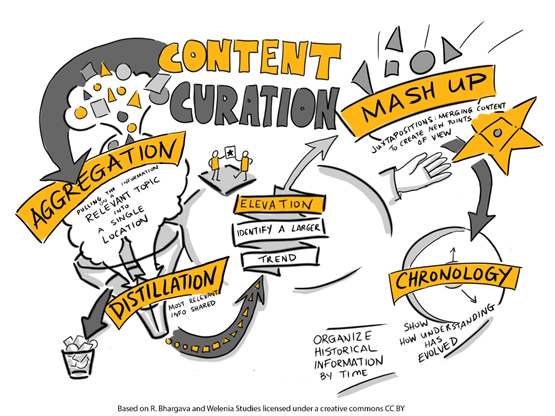 What’s your definition of content curation? Or blog about curation and Tweet the link to the blog to @ontarioextend with #oextend.